I thought I had a pretty good grasp of covenants. Studying this subject for the past three weeks, though, has taught me the truth of Paul’s words: “if anyone thinks that he knows anything, he knows nothing yet as he ought to know” (1 Cor. 8:2). Covenants are so much deeper, so much more entwined with the plan of God than I’d previously realized. And so I went back to the beginning to review covenants (today’s post) before diving deeper into the subject (next weeks’ posts). 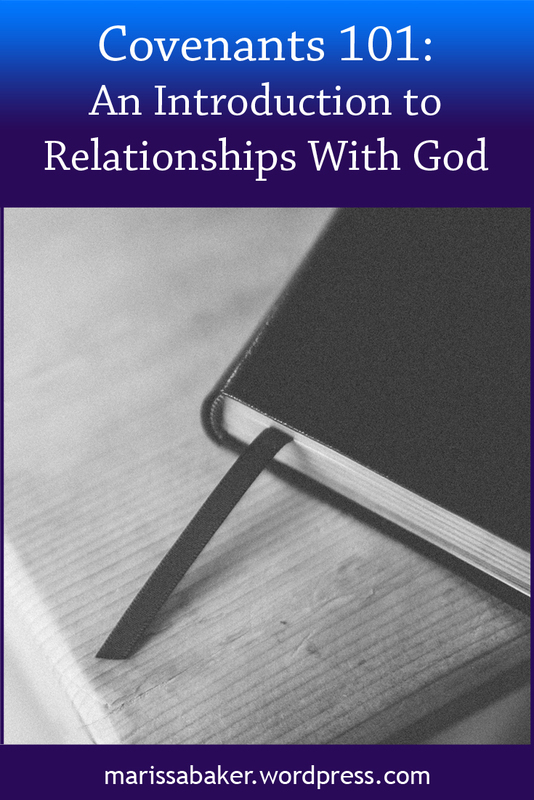 The relationships God establishes are consistently described through scripture as covenants, so to understand how God relates to people we have to study the principles of godly covenants. Hebraic understanding of covenants in the Old Testament forms the basis for understanding what a covenant between God and man involves. We need to understand that before we can even begin to get into the New Testament because Christ’s covenanting work (and the NT writers’ discussions of that) grew out of the covenants recorded in the Old Testament. If you read anything on covenant history in Biblical times, you’ll learn that covenant agreements involved the establishment of a relationship between two parties, an agreement on terms/promises, and sealing the covenant with some sort of sign. For the covenant with Noah, this sign was a rainbow (Gen 9:13). For most major covenants, though, the sign involved blood. In Genesis 15, the Lord initiates a covenant with Abraham that would form the basis of the future religious covenants with His people. The key promises were land inheritance (Gen. 15:18) and heirs (15:4-5). There’s a saying in Hebrew that you “cut a covenant” because covenants were instituted by cutting animal sacrifices in half and walking between the pieces. We see that here, with God passing between the sacrificed animals. Male circumcision was added a little later (Gen. 17:10-14) as a sign of this covenant. The Mosaic, or Sinai, covenant also involved animal sacrifice. In this case, “Moses took the blood, sprinkled it on the people, and said, “This is the blood of the covenant which the Lord has made with you according to all these words” (Ex. 24:8). This aspect of covenant is mentioned again in Hebrews 9:16-22, where the writer is analyzing the relationship between the Old Covenant and Christ’s sacrifice. The Lord’s covenant with David is another covenant that plays a key role in Biblical history. This covenant is somewhat unusual, in that we aren’t told about a sign when the covenant is established in 2 Samuel 7. It is, however, described as “a covenant of salt” in 2 Chr. 13:5. This is a specific type of covenant traditionally known as a friendship covenant. As the Rabbi in my Messianic group explains it, people in Biblical times would carry salt with them to season their food and use as money. When establishing a friendship covenant, both parties would place a small scoop of their salt on the table and mix the salt together. This acted as a sign that it was impossible to separate the two of you from the covenant, just as it would be impossible to separate your salt from your friend’s. Salt is also a part of the Sinai covenant as well. In Leviticus 2:13, the people were told “you shall not allow the salt of the covenant of your God to be lacking from your grain offering. With all your offerings you shall offer salt.” Later, the offerings are described as “a covenant of salt” (Num. 18:19) and in Ezekiel 43:23 we see salt being offered with animal sacrifices. Covenants are meant to establish relationships. Abraham was “called the friend of God” (James 2:23) and David shared a similar relationship as a “man after God’s own heart.” Salt allies the Sinai covenant with friendship as well, and Israel is also described as being in a marriage covenant with God (Jer. 31:32). Both those analogies are used again in the New Testament (see 2 Cor. 11:2 for a marriage example and John 15:13-14 for a friendship example). Covenants also include a record of the agreement between two parties. For the relationship established by the covenant to continue, both parties have to keep the words of the covenant. God is unfailingly faithful to His covenant — He set the terms, bound Himself to them, and made them available to people. Those who want to enter covenant with God have to agree to these same words. The word of the Abrahamic covenant are contained in Genesis 15, and that’s where God bound Himself to the covenant by walking between the blood sacrifices. Those words are reiterated in Genesis 17, where Abraham learns about his role in the covenant and binds himself with the sign God gave him of male circumcision. We have more words recorded for the Sinai covenant. It’s covered briefly in Exodus 19 through 24, and then expounded on through the remainder of Exodus, Leviticus, and Deuteronomy. This covenant includes a much more detailed list of what God expects from those who covenant with Him. Once again, the people bound themselves to this covenant agreement. One of the most important aspects of these covenant words was the promise of the Messiah. Paul tells us the Abrahamic covenant pointed directly to Jesus Christ (Gal. 3:15-18). Christ Himself talked about the Sinai covenant pointing to Him when he said, “all things must be fulfilled which were written in the Law of Moses and the Prophets and the Psalms concerning Me” (Luke 24:44). He’s also a fulfillment of God’s promises that David’s decedents would be established as rulers forever (2 Sam. 7:16, see also Jer. 33:14-22). This is where covenant studies really get interesting, and that’s what I plan to write about next week. Stay tuned!